As a former military spouse, I like to take every opportunity to thank our current military spouses for the sacrifices they make on a daily basis, mostly without complaint, and to highlight the important role they play in our nation's defense as they keep the home fires lit, and the family running smoothly, so that their military spouses are free to focus on the important tasks before them. Lives that would seem unbearably hectic and chaotic to most of us are quietly accepted as "normal" by these patriotic women (and men) who understand the value of their spouses' contributions to our national security and the American way of life. You will find that when you thank them for their sacrifices (and I hope you do), most will say they're not really doing that much, it's their spouses who are making the sacrifices. Don't believe that. They've so thoroughly accepted their lifestyle that they themselves don't realize all the sacrifices they make until someone else points it out to them. 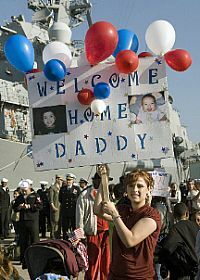 One example from my own hectic life as a military spouse: in my first year as a brand-new Navy wife, I moved three times -- about a month after the wedding, we moved to Rhode Island (for six months), then to Philadelphia (for two months! ), and then to Virginia, where we began building our first house. Of course hubby was deployed when the house was completed, so my parents came to help me move into it. We spent two years in Virginia, then two years in California, and then to Missouri for two years, where my husband was teaching ROTC, and I started law school. One year into law school, my husband received early orders, so we went back to Rhode Island for just under six months, and then back to California. In that six-month period, I moved twice and transferred law schools, biting my nails as I tried to find a law school in San Diego that would accept my transfer credits. The first law school to which I applied declined to accept my transfer credits, and suggested that I apply to their entering class. I think my (printable) response was something along the lines of "Why would anyone in their right mind want to do the first year of law school twice?!" I did find an American Bar Association-accredited law school that not only accepted every hour of my transferred credits, but because the grading systems of the two schools were different, refused to accept the transferred grades. So I started my second year of law school with a clean slate. Sometimes, there IS a silver lining to the cloud! Because of that, I was able to graduate with honors, an accomplishment I am immensely proud of. I would not have been able to do it without the equally supportive help and encouragement of my now ex-spouse. As I think back over those times, and similar experiences of our friends, I realize we took it all in stride, and just did what we had to do. We even tried to convince ourselves it was "normal." Well, at least it was normal in our circle of other military families. Sure, we sometimes complained to ourselves, and to each other. Who wouldn't get annoyed at the constant disruption of what you were trying to make as normal a life as possible? When I finished law school, and passed the bar exam, I became an active-duty Navy lawyer (JAG), something I found extremely rewarding. Because of my experiences there, helping other military families, and because of my understanding of the problems encountered by military families, I wanted to continue helping them through the pages of this site. So we dedicate this page to highlighting the contributions made by military spouses, and to recognizing their achievements. If you're aware of a story we should include here, please send it to us using our contact page.